LIVERPOOL FORWARD DANIEL Sturridge opened up about the “very tactical” training sessions under manager Jurgen Klopp. Klopp’s men are a point clear atop the Premier League after winning eight of their opening 11 games of the season. 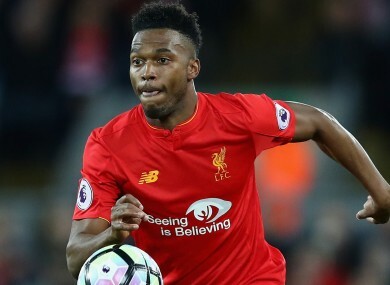 Sturridge, who has struggled to break into the free-scoring attack, said Klopp’s focus in training was mostly on tactics. “It’s very tactical-based,” the England international said, via the Liverpool Echo. “I couldn’t tell you the last time we played five-a-side. Maybe the day after a game, the players who didn’t play will go four v four, but we never really have small-sided games. We might do a shooting session but there’s a lot else going on with the passing that’s involved. Sturridge welcomed Klopp’s double training sessions with no European football this season. He said: “It’s very tactical, preparing for the opposition. In football, not may clubs do double sessions during the season but we have the opportunity to do it with no Europe and we can use that time. Email “'I couldn't tell you the last time we played five-a-side' - Sturridge on Klopp's tactical sessions”. Feedback on “'I couldn't tell you the last time we played five-a-side' - Sturridge on Klopp's tactical sessions”.